Neapolitan-style pies topped with carnitas, salsa verde, and roasted poblano (front) and butternut squash, Gruyere, and walnuts. 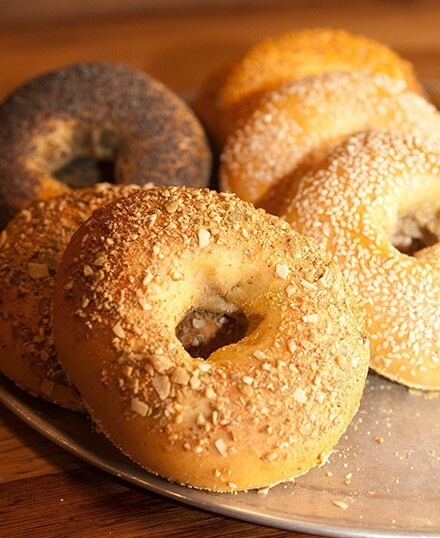 We're good with pizza in Chicago, but overdue for a bagel renaissance. For far too long we've put up with horrible facsimiles of the boiled-and-baked (or steam-injected) New York style from chains that phone it in on an industrial scale and from venerable suburban independents that have seen better days. We're right on the cusp of something. Stephanie Izard is doing New York-style bagels at Little Goat Diner, and Brendan Sodikoff has promised bagels at his forthcoming Jewish deli. But the true trailblazer of this doughy new dawn is Katie Wyer, pastry chef at Logan Square's Telegraph and its new neighboring sister restaurant, Reno. Wyer has created a brand-new breed of bagel—one heavily inspired by the skinny, crispy, wood-fired bagels of Montreal, the very existence of which is a dire threat to New Yorkers' entrenched sense of superiority. This has been made possible by the oeno-focused folk behind Telegraph (and Webster's Wine Bar and Bluebird), seizing the opportunity presented by the death of Ciao Napoli Pizzeria, which housed a 900-degree wood-burning oven that spit out creditable Neapolitan pizzas. In June Wyer began her bagel research with Montreal in mind but, due in part to the relatively small size of the oven, went through some 1,500 bagels before arriving at something that's unprecedented, not just in Chicago but anywhere. Anyone who has eaten bagels from Montreal's great St-Viateur Bagel or Fairmount Bagel will recognize these. They're skinny and slightly sweet, with a moderate but unmistakable char and whiff of smoke, yet still possessing the all-important chewiness New York partisans live and breathe for. Wyer accomplishes this hybrid by dunking the hand-formed halos in a hot (not boiling) saffron-infused water bath sweetened with malt syrup and honey. They're topped, then left to cool and rest overnight before being given a brief turn in the oven's blazing maw. Because they're skinnier and flatter than the swollen New York bagel, they have a greater surface area to take on the smokiness imparted by the oven. They're thickly topped, too, with the usual sesame, poppy, and everything options—and an occasional innovation like pumpkin seed and curry. They possess none of the gumminess that's the chief liability of bad New York bagels, but they're slightly larger than Montreal style, a bit more chewy, a bit less crispy. If Reno, led by Telegraph chef Johnny Anderes, were churning out nothing but these bagels it would still be an opening of major importance. I could go on about them (engage Wyer in a discussion about her six-month research-and-development phase and you'll see what I mean). But by virtue of variety, economy, and overall excellence, Reno will prove to be many things to many people. The pizzas, for one thing. Developed by chef de cuisine Elliot Green (like Anderes and Wyer a veteran of Avec), they enter a crowded field of worthy Neapolitan-style pies, but these stand among the best. The crust begins with light, crispy lip giving way to a softer nucleus protected by an undercarriage of stippled char. 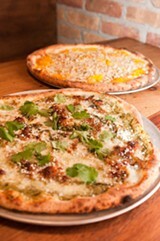 Apart from the standard mozzarella-basil-tomato-sauce Margherita variant (the Reno), there are another five house varieties distinguished by their combinations of toppings, such as a carnitas, salsa verde, and roasted poblano number, or a Gruyere white pie topped with tissue-thin ribbons of al dente butternut squash and sweet crumbled walnuts. Apart from the bone thrown to the vegans, with shaved beets, hazelnuts, and whipped tofu, these are so appealing it's difficult to opt for customization, though the range of interesting toppings—among them tasso ham, pickled peppers, giardiniera, smoked onion, roasted garlic, and dense, chile-amped pepperoni—makes it tempting to build your own. 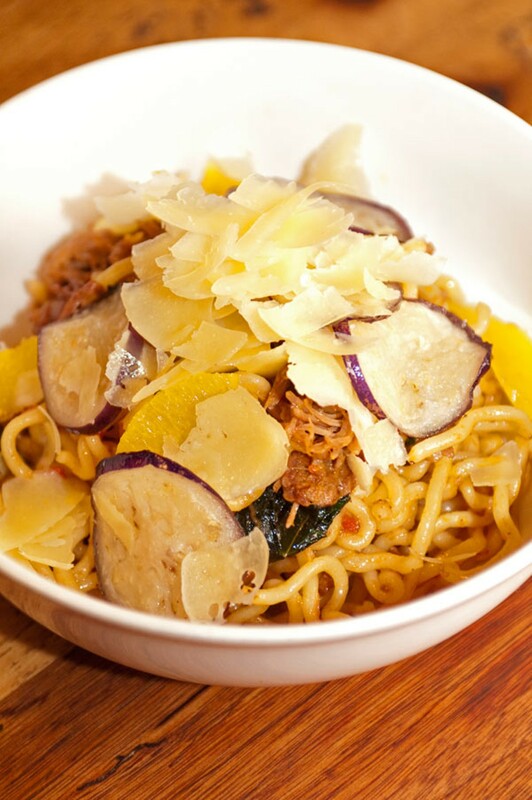 Pastas are equally good, from the ruddy and chewy tubes of spicy rigatoni Amatriciana with guanciale and bacon to the wiggly but tensile fusilli-bucatini hybrid with lamb ragu, Reggiano, thinly sliced fried eggplant, and brightening orange sections. Mostly vegetal gut-scrubbing salads (a heaping whole-leaf spinach salad with threads of crispy fried leeks) and sides (roasted cauliflower tossed with bacon and orange) round out the dinner menu. There's also a fat, juicy merguez sausage, wallowing in grits spiked with lobster roe, that stands out amid the greenery. The lunch and dinner menus are completely different, the former featuring five sandwiches on Wyer's equally innovative breads. The Cowboy Killer, anchored by a maple-y fennel sausage patty and topped with a fried egg, roasted poblanos, and caramelized onion, is drenched in a cheddary bechamel—all barely contained on a stollen-dough bun incorporated with green pepper, onion, garlic, coriander, brandy, and orange (juice and zest). At breakfast, apart from schmears, it's sandwiches again. Built on the bagels, they can be unwieldy but are still magnificent, including a towering lox, avocado, cucumber, artichoke cream cheese, and red onion stack that can barely be contained in the hands let alone on a bagel. Wyer's work also includes a daily assortment of cakes, pies, tarts, muffins, and sweet and savory brioches, and her presence is palpable in the evening as well, with terrific desserts like a crunchy wood-fired apple crisp topped with cinnamon ice cream. You could spend all day eating at Reno, an experience augmented by a wine list that, though abbreviated, is every bit as intriguing as the one Jeremy Quinn put together next door, and a spirits roll heavy on inexpensive but worthy whiskeys from former Premise (and occasional Bar Deville) barkeep Luke LeFiles. This amount of variety and ambition can sometimes be overwhelming. At dinner eaters ordering across the menu may find things arriving too fast or all at once. And the fact that Reno accepts only cash, which is dispensed by an ATM that hits you with a $2 service charge, sticks in the craw. But nothing on any of the menus comes in over $14, and whatever resentment arises from the inconvenience is quickly dispelled by the comradely front-of-the-house staff that helps make Reno a welcoming place to hole up during a workday (if you're so lucky) with a laptop, a cup of Stumptown coffee, and a sandwich. Or one or four of those miraculous bagels. No matter what time of day, it's a place where fast and inexpensive doesn't mean sloppy and cheap. MFK vets and chef Johnny Anderes present the Basque bar of the future. Two establishments, one old and one new, vie for the bagel crown.